Water, soybean oil, rice wine vinegar, parmesan cheese (pasteurized milk, culture, salt, enzymes), sugar, distilled vinegar, salt, romano cheese (pasteurized milk, cheese cultures, salt, enzymes), dehydrated garlic, egg yolk, anchovy, spices (mustard), modified corn starch, xanthan gum, phosphoric acid, sorbic acid and calcium disodium edta (used to protect quality), corn syrup, natural flavors, yeast extract, lemon juice concentrate, defatted soy flour, garlic powder, tamarind extract. 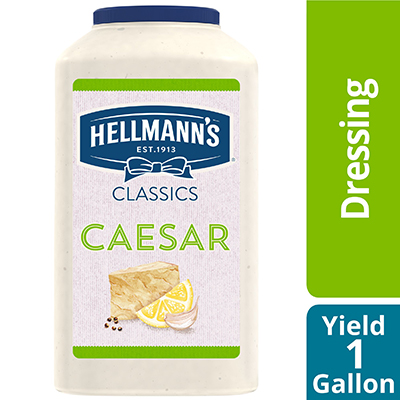 Hellmann's Creamy Caesar is Gluten-Free and has No Added MSG, No Artificial Flavors, No High Fructose Corn Syrup, 0g Trans Fat. The Hellmann's brand is recognized throughout the world for unrivaled quality and flavor and its commitment to real, simple ingredients, like real parmesan cheese.